May - Looking back to the weather in May 2006 this one was a repeat. It started reasonably warm and then turned decidedly chilly and very wet. There were several evenings when we lit the log fire and on other occasions we sat in front of the TV wishing we had lit the fire because it was so cold. In the first week we went to see Le Grand Cirque and not sure what it would be like but always prepared to try something new. We hoped it would be like the Cirque du Soleil which we'd seen on TV. It was similar but with more emphasis on the circus and the acrobatics rather than the dance and the artistic displays. Whatever we expected it was a superb night with some unbelievable acrobatics and incredible acts. There was constant action and it kept us in awe for the whole show. The warmth of April brought on Jane's plants in the greenhouse so she spent much of the month planting the young plants in the seed beds prepared by Steve with his noisy Stihl tilling machine. A vegetable plot takes constant tending and watering although the last two weeks of the month had plenty of rain. Behind Jane there are some bean poles and the runner beans from the greenhouse quickly grasped the poles ready to climb to the top. Each bean goes around its pole in the same direction - is this the same direction as in the southern hemisphere? 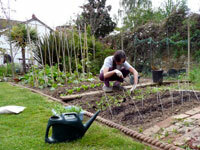 This year we've managed to get the whole plot dug over and prepared ready for a bumper crop of vegetables. Digital photography has taken over and the old Nikon film cameras haven't seen the light of day for over 12 months. Up until now we've been either lugging around the Nikon Coolpix 5700 or the Nikon D that was given to us by Clive, Steve's brother. We wanted something that was small enough to slip into a large pocket, reasonably light and with good picture quality. A lot of people confuse picture quality with how many Mega pixels the camera has but the real way to get good images is to have a really good lens - Nikon, Leica, Olympus etc. With this in mind, and not wishing to spend too much we opted for the Panasonic Lumix TZ3 - so far it's proven to be invaluable - getting used to having a screen instead of a viewfinder is not quite so easy. Many of the pictures this month were taken on the Lumix. The story of our kitchen has been going on for months. It took us a long time to settle on the style and plan the layout but that as it turns out was the easy part. 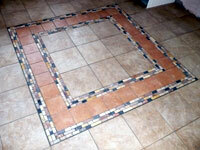 Last month the fitters removed the old units and the floor which left us with a problem of getting the screed replaced. This took three weeks to dry out completely. During this time some of the units were fitted but there were doors missing, draw handles the wrong size and internal fitments not delivered. 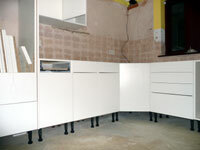 After three days all that could be fitted had been fitted. The electrician came in and moved some sockets and discovered the brand new oven unit did not work. We purchased this from Comet who were less than customer friendly or helpful. Rather than taking it back they insisted that their electrician tests the device first at our inconvenience!! The units are not complete but the tiled floor is now down and it looks excellent unless you look very carefully at one corner. We didn't think this was a particularly difficult pattern but the tiler had to put it down and take it up again a total of three times (or so he said) before it was near enough. In general we're very happy with it and it should be a real focus for the room. We live in hope that the kitchen will be complete by the end of June. For our final cultural excursion of the month we went to see Closer at the Royal Theatre in Northampton. We knew it would be interesting having seen the Mike Nichol's film with Natalie Portman, Jude Law, Julia Roberts and Clive Owen. The play was not a disappointment. It was as racy as the film, the dialogue was modern with no expletives deleted for the sensitive ears of the Northampton bourgeoisie. We enjoyed the evening and for a first night it was incredibly good with only one or two missed cues. Sadly the prompter was presumably deaf or asleep because at one point one of the cast had to ask twice for their lines. 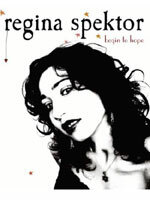 One Friday evening we watched "Friday Night with Jonathan Ross" and the music at the end was Regina Spektor. Someone we'd never heard of before and her rendition of "On the Radio" was truly mind blowing. We just had to hear more so we went into town the next day and bought it. Since then we've made several copies and we've got one in every car - TT, Honda and Smart. It keeps getting played over and over. Each track is unique, we've never heard anything so different. To find out more about this superb singer click here.